High in the alpine forests of northwestern Wyoming, archaeologists have discovered more than a dozen villages dating back over 2,000 years, a find that could alter our understanding of the scope of human habitation in the ancient West, as well as the histories and migrations of the people who lived there. And although the discovery of these sites was in many ways unexpected, the scientists who found them actually predicted they would be there. The villages were found across more than 300 square kilometers in Wyoming’s Wind River Range, at elevations over 3,200 meters, making some of them the highest prehistoric sites ever found in Wyoming — and possibly the oldest high-altitude settlements found anywhere in North America. The sites are replete with artifacts like groundstones, projectile points, and pottery, plus pipes and other wares carved out of soapstone. They also feature several — sometimes as many as 70 — stone-lined circular platforms hewn out of the mountain slopes: the foundations of wooden “superstructures” thought to have been lodges. Judging by the settlements’ lofty location, along with their architectural features and artifacts, archaeologists believe they were built by early Numic-speaking peoples, the mountain-dwelling ancestors of the diverse but related tribes that today include the Comanche, Ute, Shoshone and Northern Paiute. “In archaeological research, mountains have generally been overlooked as fringes, boundaries, and marginal landscapes,” said Matthew Stirn of the University of Sheffield in an interview. He announced the discovery in a recent study published in the Journal of Archaeological Science. As important as the newly found villages are, they were not the first to be discovered in the Wind River Range, Stirn noted. In 2006, Dr. Richard Adams of Colorado State University and his team found a prehistoric village at 3,500 meters above sea level, with evidence of more than 65 residential structures. 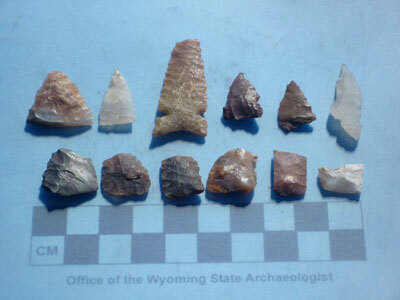 Dubbed High Rise Village, the site featured artifacts and traces of lodges dating over at least 2,500 continuous years, opening up a new frontier of high-altitude archaeology in the intermountain West. Stirn was part of the team that found High Rise Village, and in the following two years he and Adams, along with Bryon Schroeder of Montana State University, discovered five more villages in the mountain range that dated to around the same era. “Much to our surprise, the high elevations of the Winds were more dense archaeologically than their surrounding lowlands,” Stirn said. Specifically, he said, all of the villages were located in or near stands of whitebark pine trees, which are prolific producers of nutritious nuts. 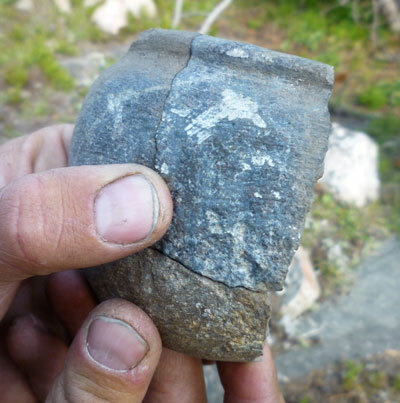 The lodge sites also contained an unusual abundance of tools, like groundstones, that have typically been associated with processing foods like pine nuts. So Stirn set out to develop a model to predict the location of more, similar villages. He first determined all of the main traits that the newfound villages had in common — namely, that they were positioned on south-facing, sunny slopes near whitebark pine stands above 3,200 meters in elevation. Then, using Landsat satellite imagery, Stirn and his colleagues identified whitebark pine stands in the northern Winds that best fit their model’s description. And in 2010, with the backing of the Explorer’s Club and the Abernethey Research Foundation, they lit out to investigate the sites predicted to be mostly likely to host prehistoric settlements. In the end, each of the 13 areas they surveyed revealed traces of ancient villages — the remains of lodges, soapstone relics, and nut-milling tools associated with the lifeways of ancient Numic-speaking peoples. But these sites posed a new quandary: Judging by the artifacts, the newly found villages appear to date to around the heyday of High Rise Village — about 2,000 to 2,500 years ago. But this is centuries older than — and the sites are thousands of kilometers away from — the only other Numic mountain villages known to exist, in Nevada and California. Those sites farther West, first discovered in the 1980s, betrayed the same influences of Numic culture — including what Stirn describes as “the exact same tool kits” found in Wind River for processing pine nuts and other foods. Considering that the Numic family of languages extends from Southern California up to Wyoming and Montana, it was conjectured at the time that the culture may have originated in these Southwestern mountains and migrated East. But the California and Nevada villages were only around 1,400 years old, some 600 to 1,100 years younger than the sites in the Wind River Range. “If the Numic spread originated in California and moved to Wyoming, how come the Wyoming sites are older than those in California?” Stirn asked. “More corroborating evidence would be necessary to prove this, but for the time being, it is a very thought provoking possibility,” he said. Excavation of the Wind River villages will help fill in the great missing gaps in the map of Numic history. For now, Stirn said, their discovery reveals the tremendous, and largely overlooked, potential of high-altitude archaeology to rewrite entire chapters of Western American history. “Since 2006, we have surveyed roughly 800 miles and recorded well over a thousand sites and artifacts above 10,500 feet in Wyoming,” he said. have lived here all my life and spent alot of time hiking the winds…please forgive my ignorance but could these people be who are referred to as the sheep eaters? Thanks for writing; that’s a really good question. The research actually does mention that many of the artifacts found at High Rise Village are indicative of the Mountain Shoshone, or Sheepeater culture. Some of the sites seem to have been used for so long that they may have been used by cultures that experts now know by other names, too. I hope to post a follow up soon about the full range of these sites’ use, and who used them. But I’m glad you brought that up. Thanks again. Weren’t sheep brought into the new world by the Spanish? Big horn sheep…..not farm sheep.. This isn’t the new world. Stop it with your Eurocentric trash. Could it be that these were seasonal locations where the inhabitants were there for summer/fall hunting and gathering and exploitation of stone materials used in tool fabrication? Said locations would be ideal corridors between the high mountain (summer use) and low lands (winter use) . As I read this article the seasonal use is exactly what I was thinking. It is as cold as the dickens in the flats of the Winds let alone to be up so dang high in the dead of winter. Hi Gerald and Dennis. Thanks for asking about this, because I did, too, but I wasn’t able to work the aspect of the research into the post. Matt did say that they assumed the sites were seasonally inhabited. Stirn, Adams, et al., continue to work on this, and I will too. I’ll be posting a follow up as soon as more data is available, so be sure to follow me and subscribe and keep coming back! Thanks to everyone for all of your fantastic interest in Western Digs’ coverage. I am a member of the Comanche Nation. I find these new found sites extremely interesting and exciting. Our elders have told (oral tradition) stories handed down from their ancestors about living in the mountains. Since I am from Southwest Oklahoma and we have small hills, that description (of living in and around tall mountains) was always so foreign to me. Also what Brandon says about the little people, Nunupee’s is what Comanche’s call them, would be interesting as well. We too have stories and sightings of these Nunupee’s in our area. Keep up the good work and congratulations on your research. Has anyone ever canvassed Casper Mountain for prehistoric sites? I remember coming across some stone structures that seemed to be like dugouts. They were on the very western end of the mountain and the view from the structures was one of a hundred miles to the west. It seems it would have been a perfect place to watch out for approaching danger. I have always wondered about them and who may have built them. Blake was any rock art encountered at elevation? Jasper, another very good question. Matt didn’t mention any, and I don’t see any reference to rock art in the paper, but he did say that his team will be investigating earlier sites at those elevations, as well as lower-lying sites that might have been winter encampments. So, you never know what will turn up. Be sure to subscribe or otherwise follow, and we’ll keep you posted! OCCUPATIONS IN WYOMING’S WIND RIVER RANGE suggests the most intensive period of occupation at High Rise was 1500-500 BP. 2500-2000 BP for the new sites is interesting. Has the white pine dendrochronology been worked out to your knowledge? Blake, has any discovery work been done in the Big Horn Mountains, the Gros Ventre Mountains, Wyoming Range, or the Uinta Mountains? Those mountain ranges also have elevations near or at 10,500 feet. I don’t know about whitebark pine stands in those mountains. I lived at Calpet for a number of years. While living there, I went to the base of the Hogsback in search of fertile, dark soil for a garden. I found some at a spring and as I dug the dirt I found animal bone fragments (ribs, joints, leg bones) on gravel about 1′ – 2′ deep indicating that the spring was likely much more active in the past. It may have been a camp site at some time in the past. I’ve been interested in revisiting the site, but it is now, and likely was then, on private property, which is now occupied. Was an avid back packer here in the winds for over 30 years and have always been interested in artifacts. while walking a rocky ridge overlooking a creek, i found a hole that had been dug about 4 feet down shaped like a bowl about 8′ across. at first i thought it was a prospecting hole but there was no dirt just filled with small rock. walking on i found 2 more about 50 yards apart. all three looked the same. i dismissed them for years untill i was reading about the sheepeaters and how they would dig these along known trails of the mountain sheep to hide in wait for their game to come by. Its in an ideal place. I am very excited to go back to this place and check it out further. This gets more exciting every day for me. I am extremely interested in these ancient villages found in the Wind Rivers. So much so that i have wrote a book, about a Mountain Shoshone (Sheep Eater) medicine woman. Although fiction, I have used my knowledge of the Winds, having been an avid back packer and fisherman for three decades, along with what i have read about these people as a backdrop. I hope to meet a man who is studying these sites through a mutual friend who purchased one of my books. Although i am no longer able to climb to those elevations due to my exposure to agent orange, I know i must have walked past many of those sites. This is very discouraging and truthfully, heart breaking for me. But hopefully by being able to talk to this gentleman i might be able to paint a more accurate picture of the way these people lived. Any information, any at all, will be appreciated. Say hello to Bryon Schroeder and his crew! I am looking to find some information on a small stature tribe of Indians whos remains were discovered by a sheep hunter when his kill fell onto one of their platforms they carved out of the mountains. I have been to the sight a few times but have never been able to find anything about them. From what i know some people refer to them as the little red people because of the color of their hair and they were killed by the Shoshone because they were stealing food and terrorizing their camps.People went to the sight and all the artifacts were taken to a museum back east. The area i have been to is between bliss creek meadows and hidden basin in Wyoming. Any help would be great, thank you! Over here in Idaho, the Sheep Eater Shoshone (Tuku-Dika) have been dated back to occupying the land for over 15,000 years. I’m pretty sure it’s the same dating a couple hundred miles away. Time to return to some more stolen lands. The finding and exploration of all these sites across the mountain west from the Wind River range to the Mojave suggest the possibility of various climate changes over the millennia that would account for long term settlements in what we would consider some very hostile environments during certain times of the year. The native people would obviously adapt by seasonal or gradual migration following game, wild food sources and moisture patterns? They would be very adept at taking advantage of the resources available, unlike their modern cousins dependent on energy intensive high tech food sources. As to adaptation any good local native museum like the Museum of the Plains Indian in Browning is a great example of the high level of adaptation to their environments and how they flourished as a society for many thousands of years? 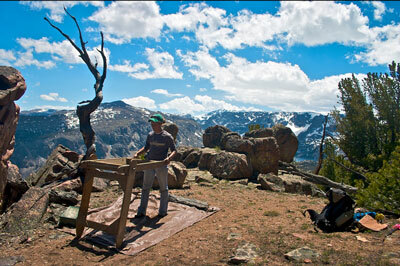 I just returned from a 2 week backpacking trip in the Bighorn Mtns. I found a 3′ long stick with strange carvings in it. Looks very old. Nearby I found a bison horn, so old it’s paper thin fragile. Little bacteria and rodents at 10,500′ elevation, so these items may be very old. No way a bison would be at 10,000′, so someone brought it up there. We’re speculating; a quest of some sort? A calendar stick? Was the horn used to ladle water or carry food? A buffalo headdress? I brought the items home with me but would return them to a tribe in exchange for information as what they may mean. I’d like to honor the life of whoever left these items up there. Can someone discuss these items with me? I live in Minnesota, and an old Ojibwe friend told me the stick is definitely native, but he doesn’t know what it could be. I’ve found medicine and calendar sticks online that look a lot like this one. Thanks. If you see Cloud or Raven. Two old infamous stallions of the Pryors that have not been seen since last Nov.2015. Some say they perished through the winter others are thinking the two ole timers, no longer herd stallions took off in the Bighorns.